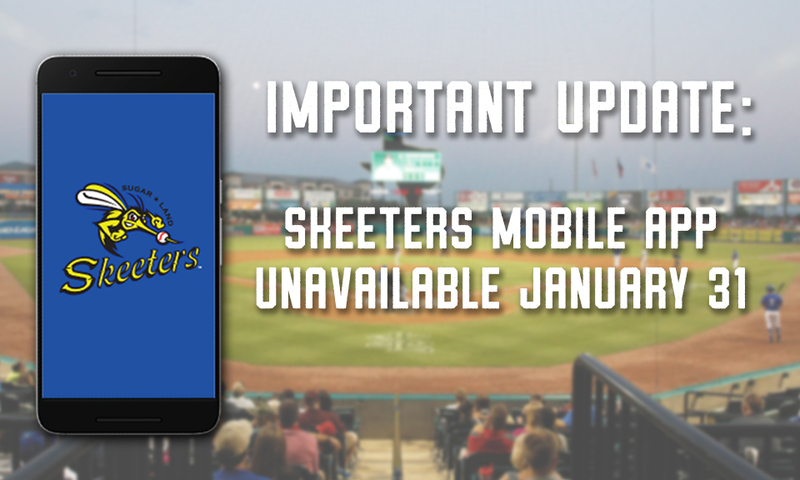 We were recently informed that the hosting company for our Sugar Land Skeeters mobile application, Hopscotch, will be going out of business, effective Jan. 31. Unfortunately, this means our mobile app, along with the mobile apps for an abundance of professional sports teams, will be no longer usable as of Jan. 31. As for many of Hopscotch’s users, this move came as a shock to us and we are disappointed that this move was out of our control. We know many Skeeters fans rely on the app features to receive pertinent information about the team, along with buying tickets and earning rewards. We have begun our search to resolve this issue and plan to exhaust all options to ensure we will have a usable mobile app by Opening Day. Thank you for your patience and we will make sure to continually update our loyal fans as we search for a solution. Stay tuned to our website and social media for any and all updates regarding our new mobile app.